On the night of 21st/22nd June 1944, one of the shortest nights of the year, 16 Lancasters of 619 Squadron at Dunholme Lodge, were to be included with aircraft from 44 Squadron and 49 Squadron in a task force of 133 Lancasters and 6 Mosquitos to attack the oil and fuel dumps at Wesseling, to the south of Cologne. This was considered a tough target, deep into enemy territory and new crews were not included. Lancaster ME846, delivered to the squadron on 11th June, had only flown 8 hours and was to carry a big load of both fuel and bombs for this raid. For the first time in the seven missions completed by the chosen crew, the bomb load was to include a “Cookie” (4,000lb bomb) plus 16 x 500 lb bombs and the bombing height for this raid was fixed at 20,000 feet. Pilot: Pilot Officer Mark Anthony Hamilton “Dave” Davis, RAFVR. Flight Engineer: Sergeant W. Dennis “Geordie” Belshaw, RAF. Bomb Aimer: Flight Sergeant Peter Edmund “Pete” Knox, RAAF. Navigator: Flight Sergeant Leslie E. J. “Tag” Taylor, RAF. Mid-Upper Gunner: Sergeant George Harry Moggridge, RAFVR. Rear Gunner: Pilot Officer John Ernest Ralf “Porky” Bowering, RCAF. From the diaries of Peter Knox, Leslie Taylor and Dennis Belshaw; from RAF records as well as the official report submitted by the crew of the German fighter that shot down the Lancaster, we know some of the events that took place that night. The route for this raid was to take the bomber stream in various dog-legs, in order to confuse the enemy, to the eventual target at Wesseling, south of Cologne, starting from an assembly point over the North Sea for all the aircraft involved, which was at 5230N/0300E. At 2301 hours the heavily laden Lancaster lumbered off the runway, rising slowly over the Lincolnshire countryside with its heavy load, the pilot, “Dave” Davis, struggling to join the 15 other Lancasters of the Squadron as they moved out towards the North Sea. Leslie Taylor, as navigator, had set the course to the assembly point and then on reaching this, had given a new heading to Dave to the next marker at 5145N/0350E, just south of the island of Walcheren, where the whole bomber stream was to be at 14,000 feet. As they flew over the North Sea towards Europe, they ran into a problem. Flight Engineer, Dennis Belshaw takes up the story. “Initially the trip was quiet & uneventful, then just after the first hour had passed we started to have our first trouble. It was nothing serious just a spot of overheating in two of our engines so I, as flight engineer of the aircraft, advised the Skipper to level out, for at that time we were still climbing on course. The Skipper taking my advice, levelled out and so, for the next 15 minutes, we flew along that way. When I decided that the engines were cool enough to resume climbing, I passed on the information to the Skipper and we started once more to climb. It was through this method of climbing in slow and easy stages that we got to 14,000 feet when we crossed over the Dutch island of Walcheren, close to the Belgium border.” On reaching this next marker, Leslie Taylor gave a new heading to Dave of 090 degrees which would take them and the rest of the formation clear of much of the known anti-aircraft batteries. All the aircraft were to climb to 18,000 feet. Leslie Taylor was equally shocked and reports on hearing the instruction to abandon the aircraft: “My God, I’m a dead man I thought to myself. However, I seemed to move away from my navigation table as if it were all part of the usual routine. I clipped on my parachute pack, discarded my helmet and moved forward to the nose in readiness for the “bailing out”. From the cabin I could see that our starboard outer engine had gone and that we were blazing furiously aft. I tapped the pilot on the shoulder and waved cheerio. Once in the nose, without losing a single second, I plunged through the escape hatch.” The wireless operator, Thomas Newbery followed Leslie out of the aircraft. Unfortunately we do not have his account. Meanwhile, as the aircraft had rapidly descended out of the main stream of the formation, Dave had turned the aircraft to port and onto a reciprocal course and although uninjured had been holding the lurching plane as steadily as possible to allow all of the crew to escape. What happened next is not clear. It is known that the flight engineer, the navigator and the wireless-operator left the aircraft after the bomb aimer, but the fifth to leave by that exit, Dave, did not follow and it would appear the two gunners never made it from their exit either, despite a clear indication from the mid-upper gunner, George Moggridge, that he was jumping. However, both Peter and Leslie were sure that the rear-gunner, John Bowering, already lay dead in his turret as nothing was heard from him over the intercom before they jumped. It is therefore likely that whilst Dave stayed at the controls of the aircraft, George Moggridge, on clipping on his parachute in the rear of the plane, noticed that the rear-gunner had not left the aircraft and went to his aid, telling Dave of the problem at the same time. However, with the starboard wing and the rear of the fuselage now on fire, it is also possible that the escape exit for the gunners was blocked by these flames, as their exit was on the starboard side of the plane. The crew of the Messerschmitt reported that after being hit, the Lancaster went into a left curve and into a steep dive, burning brightly. At the upper layer of cloud cover at about 1,000 metres (3,300 feet) there was a small explosion and the aircraft broke into two parts with the right wing falling away from the fuselage. The two parts crashed at 0114 hours with the impact fire seen as a sudden illumination through the thin cloud cover. They reported the wreck site to be about 20-30 km south-south west of Eindhoven. 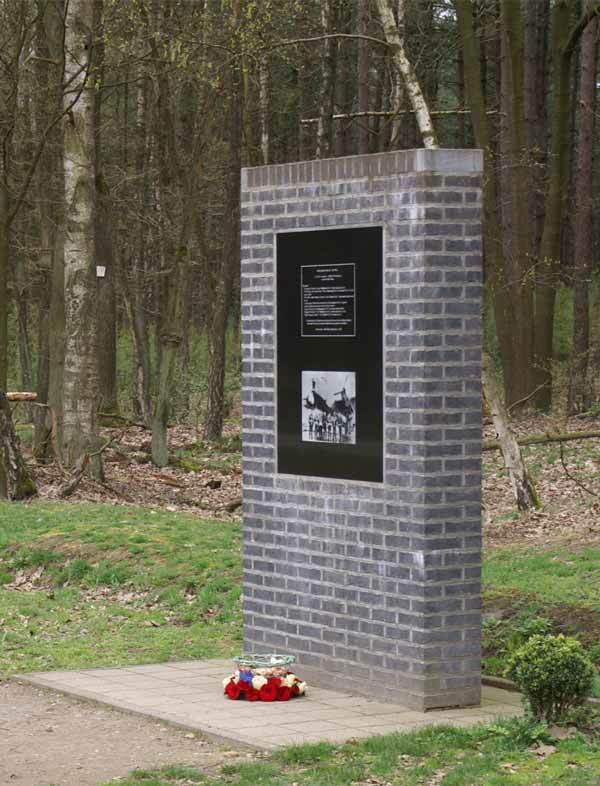 This reported “sudden illumination” would have been when the aircraft’s bomb load finally exploded, for, according to RAF records, the aircraft exploded in mid-air with the crash site in the Bladel Woods on the Dutch side of the boarder with Belgium, but nothing to identify it has ever been recovered by the RAF. Peter Knox, Leslie Taylor & Dennis Belshaw indicated that it exploded below them whilst they were still on their parachutes above the cloud cover, so, like the crew of the Messerschmitt, all they would have seen would have been the illumination of the explosion through the cloud. This explosion of the aircraft is confirmed by the Parish priest from Postel who says “1944, night of 20 June; (it is thought that he has the incorrect date as no aircraft were reported lost over Postel on 20th) heavy firing from Flak to squadrons of RAF-planes flying direction Germany. A loaded bomber exploded in the air in the vicinity of the border-markers on the Bladelse weg. The explosion was so violent that all the windows of the houses were broken. Two "pilotes" (airmen) were found dead, very heavy wounded ("vermorzeld"= "crushed"?). Others were saved by parachute. One of them with a "sprained ankle" gave himself up to the Germans, after landing at "Steenovens" (a location about 4km south of the presumed crash site. This man is thought to be the fourth crew member to bail-out, the wireless operator, Thomas Newbery.) On June 23, 14 German soldiers arrived in the abbey. Their task: to clean up all the plane-wreckage in the entire region..."
From Leslie Taylor we know that the aircraft was shot down at approximately 0120 hours on 22nd June, near Postel and close to the Belgium/Dutch boarder. He estimated his position when he landed as 15kms southeast of Postel but to the northeast of a canal or river which blocked his movements to the west. Peter Knox, bailing out first, had landed further to the south-east, but on the southern side of this obstruction and therefore had an easier route towards the west. German reports confirm the crash site to be 4kms north of Postel. Leslie Taylor, Thomas Newbery, and Dennis Belshaw were eventually captured and spent the next 11 months until the end of hostilities, as prisoners of war. Peter Knox made contact with the Belgium resistance movement and eventually arrived back in England, where he immediately insisted on meeting with all the British families of the crew to inform them of the circumstances of that night. On his way home to Australia, he stopped in Canada to meet with the parents of John Bowering too. These families have always been most grateful to Peter for this selfless act in taking the time to explain to them what had occurred that night. The RAF losses for this raid were very high, with 37 aircraft failing to return, a loss rate of nearly 28%. 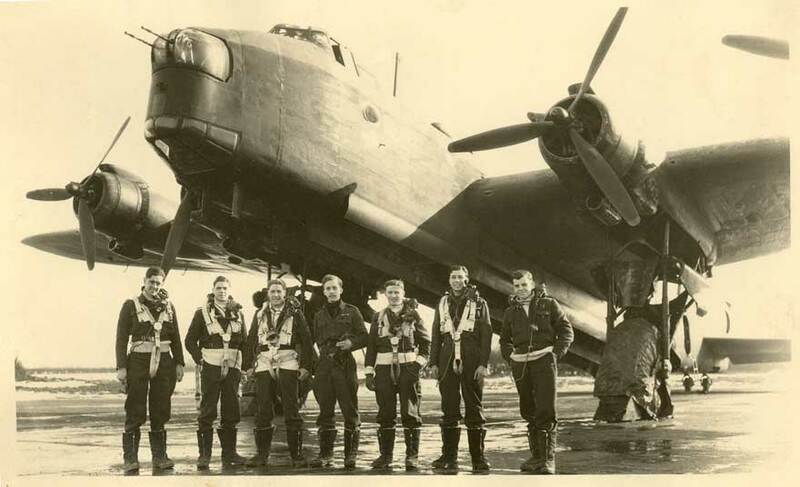 For 619 Squadron the loss rate was even higher as 6 aircraft failed to return out of 15 (one aircraft had to abandon the raid due to technical problems), a loss rate of 40%. The comment in the squadron Operation Log says “Six aircraft did not return, a very black blot in the history of the squadron. Never before have so many failed to return from one operation”. The bodies of the two gunners from ME846, Sergeant George Moggridge and Pilot Officer John Bowering were recovered and were moved to Deurne and then re-buried side by side after the war at the Schoonselhof cemetery in Antwerp in Plot IVa, Row F, Graves 16 & 17. But of Dave there was nothing. One year later his mother still not knowing if her son was alive or dead, wrote to the mother of Dennis Belshaw, “My son was the pilot of the aircraft in which your son was the engineer. The Air Ministry say they can find no trace of my son and if you have any news of your son or any information as to how the aircraft was abandoned, will you please let me know? I know nothing and the suspense is beyond words! Please let me know all you can.” Despite the information supplied by the surviving members of the crew, she died 8 years later, resigned to the fact that her son had died that night, but still not knowing where her beloved son’s body lay at rest. The families of the crew will not forget the actions of Dave and all the crew that night in those vital two minutes between being hit and the aircraft eventually exploding for, of the four who escaped and subsequently married, three produced offspring who in turn have married. There are now over 35 people who owe their lives to the courage of Dave remaining at the controls of the aircraft and many live in the hope that his final resting place will eventually be found. The closure of this would be the recovery of Dave’s remains for a formal burial. However, this seems highly unlikely, as the records held by the RAF confirm the total disintegration of the aircraft, a not uncommon occurrence for a plane fully laden with fuel and bombs which is also crippled by fire. For me the final chapter of this story will to be the recovery of Dave, as he was my mother’s youngest brother, aged just 20 years. On 11th June 2005 a plaque was dedicated to the crew at Newark Air Museum as it was on this site when it was RAF Winthorpe, 1661 Heavy Conversion Unit, that the crew trained on four engined Stirlings in March 1944 before being posted to their squadron at Dunholme Lodge. Many of the relatives of the crew attended this event. On 3rd September 2006 my wife and I and 55 relations and friends of the crew of Lancaster ME846 and over 200 local people were present at a ceremony in Belgium to commemorate the crew and also members of the Belgian Resistance who helped so many stranded allied airmen return to the UK at a considerable risk, not only to themselves, but also to their families. A monument to both the crew and the resistance has been erected by the mayor and people of nearby Mol. This is situated in the Bladel Woods close the Dutch border and as near to the probable crash site as possible, although no information as to the exact location has yet emerged. On 20th October 2010, Jane Kiepura has received an email from a Belgian, Koen Peeters, telling her that in the past 10 days he had discovered bits of aluminium and “broken bullets” in an area north of Postel Abbey on the Belgian side of the border with Holland. On 21st October he identified a large crater in the Bladel Woods with more debris and he wonders if this might be the crash site of ME846. He has spoken to Kamiel Mertens who is one of our Belgian contacts investigating all the leads to where ME846 crashed. On 22nd October Koen Peeters found what he believed to be a metal buckle from a parachute, which is significant because there were possibly three parachutes in the aircraft when it crashed. On 23rd October Koen Peeters decided to stop digging any further and to leave this to the proper authorities and out of respect for the possible remains of the pilot that may lie at this location. On 26th October 2010 Kamiel Mertens and Wim Govaerts visited the site and confirmed that a British aircraft had crashed at that location and that it was most likely to be ME846. In their opinion, the crater was consistent with the explosion of a 4,000lb bomb. So perhaps the aircraft had not exploded in the air, but on the ground. On 5th April 2011 Howard Heeley and I visited Postel Abbey in Belgium to meet with Father Ivor Billiaert, Kamiel Mertens, Wim Govaerts, Koen Peeters and Cynrik De Decker, to discuss if a search of the surrounding area was feasible. 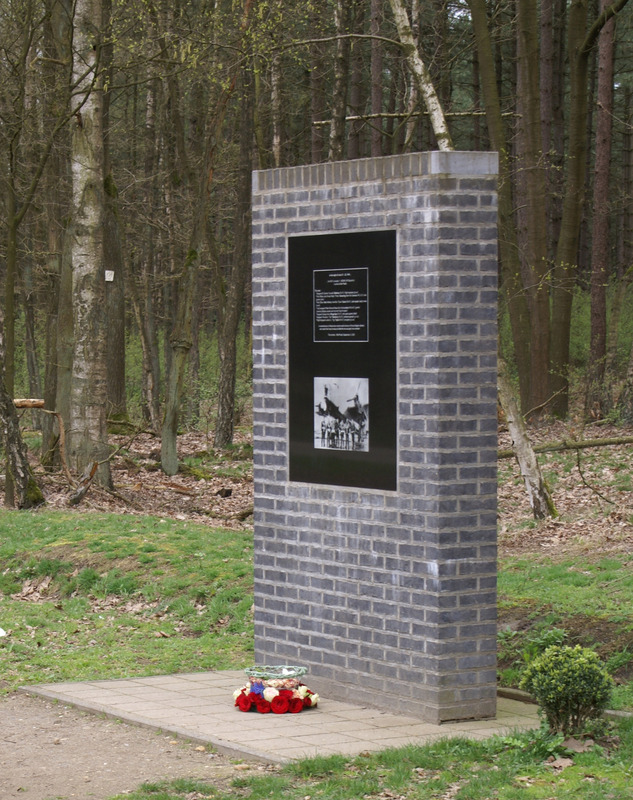 We visited the site, which is a peaceful location within the Bladel Woods about 300 metres from the Dutch border. The crater is 14 metres across and 4 metres deep. This has been deepened by the forestry authorities to hold water for fire fighting purposes. Pieces of aluminium are evident all around and some ferrous metal is buried more deeply, which is going to be investigated as these could possibly be unexploded bombs. British ammunition of .303 calibre used in Lancaster guns turrets was also found. It was agree that members of BAHA will conduct a survey of the area this summer to investigate if there is any evidence to justify a major excavation in the area of the crater. On the night of 21/22 June 1944, their aircraft (Lancaster 1 – ME846, Reg. PG-C) suffered severe night fighter damage and the starboard outer engine caught fire. Whilst the pilot held the aircraft steady, he instructed his crew to jump. Four of the crew are known to have bailed out and survived. According to RAF records and ground reports, the aircraft exploded in mid-air, close to the ground. An intensive search located the bodies of the rear and upper gunners, but failed to find the remains of the pilot or indeed much of the aircraft. Flight Sergeant, P. E. Knox – Evaded capture and escaped back to England. Sergeant, T. A. Newbery – POW. Pilot Officer, M. A. H. Davis – Killed in action– No known grave. Sergeant, G. H. Moggridge – Killed in action – Buried: Schoonselhof Cemetery, Antwerp, Belgium in Plot IVa, Row F, Grave 16. Pilot Officer, J. E. R. Bowering – Killed in action – Buried: Schoonselhof Cemetery, Antwerp, Belgium, in Plot IVa, Row F, Grave 17.